Welcome back to another challenge with the Paper Craft Crew! We are so excited that you’re joining us again – I hope that you have as much fun with this new challenge as I did. The card base is Mossy Meadow cardstock, with a panel of Crumb Cake cardstock on top of that. I used the snowflake stamp from the Perpetual Calendar stamp set and inked it with White Craft ink, and stamped some snowflakes across the front. 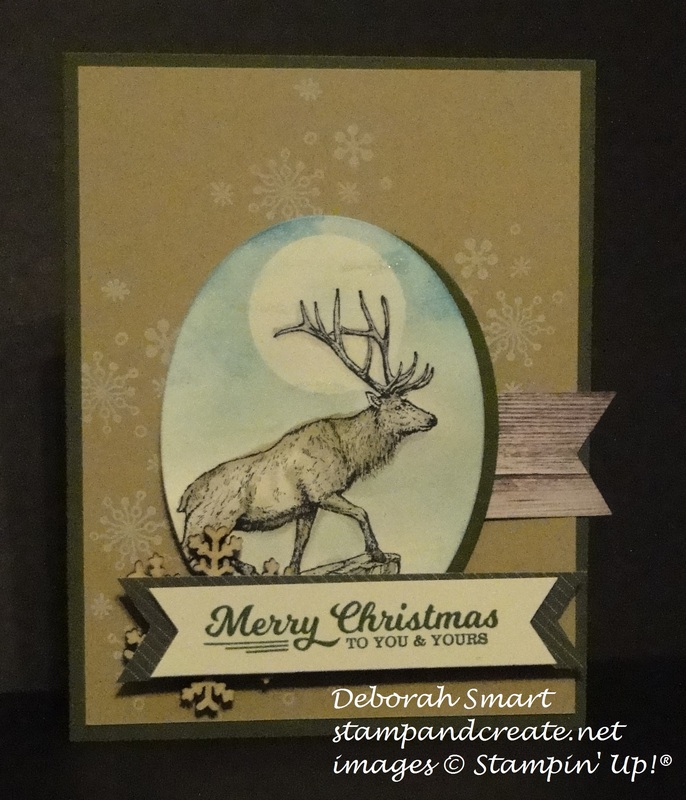 I started by stamping the image in Archival Black ink onto Whisper White cardstock, then using my Aqua Painter with the Crumb Cake and Tip Top Taupe ink pads to colour in the elk -er, reindeer. The rocks were coloured in the same Crumb Cake and Tip Top Taupe, with a little bit of Mossy Meadow. I then punched a 1 1/2″ circle from a Post-it Note to mask off the moon, and sponged the sky using Sponge Daubers with Soft Sky and Pacific Point ink pads. After removing the mask, I sponged a little bit of blue onto the moon, so it wasn’t so ‘stark’ white. I used the Ovals Framelits to die cut the image, and also cut another of the same size in Mossy Meadow cardstock. I layered them, with the Mossy Meadow just a bit to the right. I then added a banner cut from the retired Adventure Bound DSP stack, and stamped the sentiment from the To You and Yours stamp set in Mossy Meadow, and layered it onto another pattern of the same DSP, with a Snowflake Element tucked in behind it. I hope you’ve enjoyed seeing my card; thanks for taking the time to stop by! 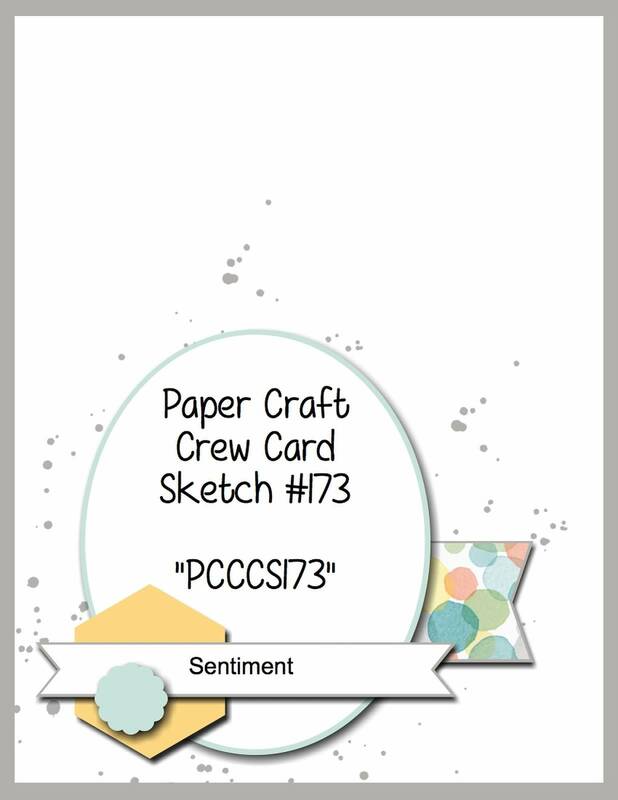 Please head over to the Paper Craft Crew page, and see the cards the rest of the Design Team have made for your inspiration. So many talented people; and you’re one of them! If you have time, I’d love to read any comments you would like to leave for me. Are you all ready for the Christmas holidays, if you celebrate them? I am waaaay behind on my shopping – and my personal cards – oh, well! ‘Tis the season, it seems, to be rushed! As hard as I may try, I’m usually a bit behind on something. Next Next post: IT’S THE YEAR-END SALE! Love your card, Deb. I have to say, however, that my heart skipped a beat when I saw it. Over a week and a bit ago I designed a very similar one for our Watercooler Wednesday Challenge—the one which begins December 9th. What a coincidence! You’ll see what I mean when you come over and check out the challenge. Great minds, right Heidi!? Wow, that was close, wasn’t it? It was my 1st time using the elk – glad you liked it! Great card, Deborah! I love your reindelk!